Since 1982, Alert Protective Services has been Chicago’s premier, award-winning and locally owned and operated source for your home and business security needs. APS is a leader in business and home security systems in Chicago and the surrounding area. For over 25 years, this family-owned company has stood behind their outstanding products and services. APS’s highest priority is customer reliability. All of the owners, operators, and technicians live in the Chicago land area and they know exactly how to minimize the security problems local residents and businesses face on a daily basis. Unlike other security providers, APS has no out-of-town-management. This means that our customers receive the most rapid and prompt service available. APS provides the highest level of protection possible to ensure the safety of your family and home. APS strives for customer satisfaction and loyalty. They treat every customer with the same high level of service and protection that they use to protect their own families. Residents of Northbrook are entitled to all of the premium products and services that all of our customers do. APS provides round the clock 24 hour-a-day support on all their products and services. Northbrook is a village on the northern edge of Cook County. It is 25 miles north of downtown Chicago. The village has a population of 33,435 residents and 12,203 different households. Northbrook is known for its high standard of living. The median household income is $115,842 and the average home value is $391,400. Although Northbrook is not affected by that much crime, the number of thefts and burglaries has been rising. Last year, there was an average of 30 crimes committed per square mile in Northbrook. There were a total of 393 crimes reported in 2009. 378 of which were property related thefts or burglaries. Only 15 were reported as violent crimes. Although, violent crimes are far more severe in nature, they occur far less often. The chance of being a victim of a violent crime is 1 in 2265. This is low, compared to the chance of being a victim of a theft or burglary, 1 in 88. Homeowners should be aware of these risks. 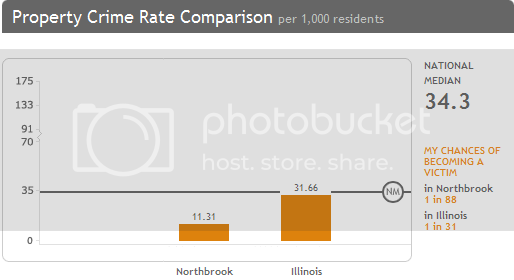 You can see that thefts and burglaries affect far more residents of Northbrook than violent crimes do. All residents should have a professional from APS come out and diagnose your home security needs. Every home should have some form of monitoring system in place and most homeowner insurance policies offer discounts to those who do. In a recent study conducted by the FBI, it was discovered that homes with security systems are 15 times less likely to be burglarized. Alert Protective Services offers a wide variety of home and business security products. With so many types of systems on the market, it is often difficult to determine which system is exactly right for you. That’s why you should contact our certified professionals and give them the opportunity to assist you in selecting the best system for keeping your home and business secure. Our APS skilled experts have the extensive experience and knowledge required in order to customize the monitoring and security systems which best fit your family and business needs and your budget. Call today and let Alert Protective Services begin protecting your home and office.